Visitors to Greece tend to think of the mainland when it comes to the country’s vast archeological heritage but the islands are also peppered with fantastic ancient and Venetian sites. 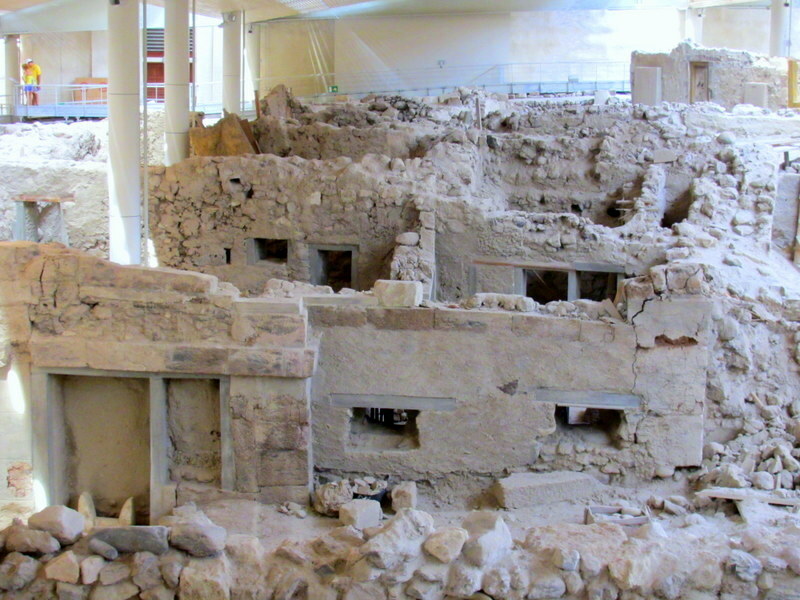 On Santorini, the cataclysmic 1700 BC eruption that gave the island its astonishing caldera also created one of the world’s most unique archeological sites — Akrotiri. 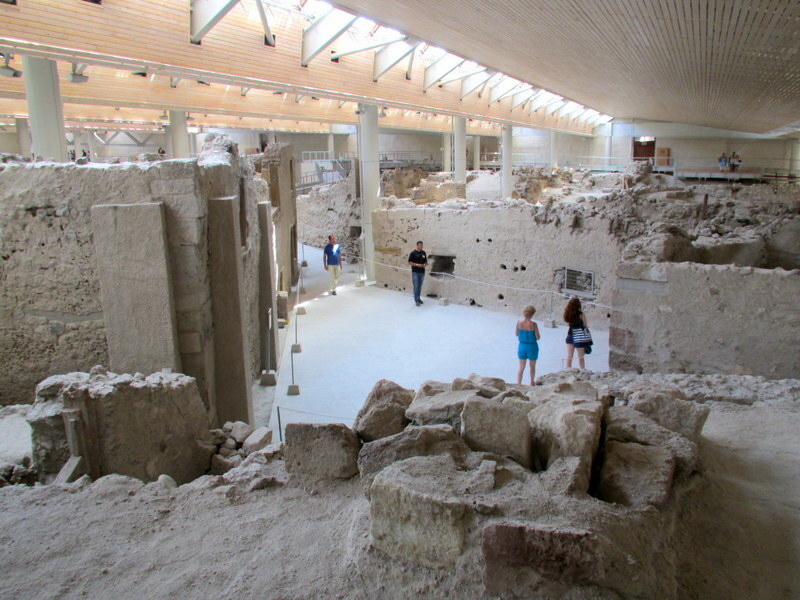 Reminiscent of Pompeii, Akrotiri is an ancient town buried by the ash of an enormous volcanic eruption. Unlike Pompeii, however, everyone had evacuated Akrotiri by the time the volcano blew and so no human remains have been found at the site. In fact, the inhabitants had abandoned and then returned to the city several times as pre-eruption earthquakes became more frequent and intense. 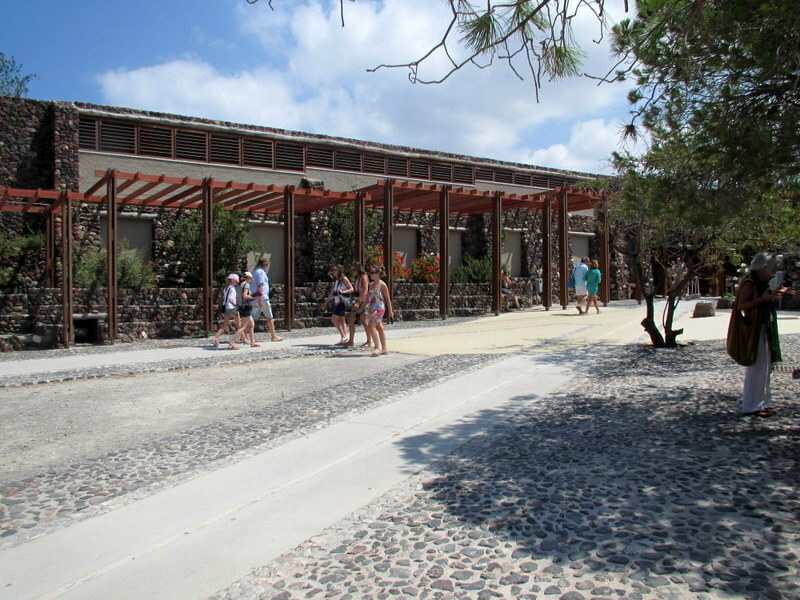 The excavated portion of the site is protected by a new, earth-covered roof that keeps it nice and cool inside while providing for light and ventilation. What one sees inside is the excavated portion of a complete ancient town, apparently occupied by relatively well-off traders and merchants who had no need of defensive walls. Built right down to the edge of the sea, there was obviously no worry about pirates, either. The photo above is of a building called West House, in which were found some of the beautiful wall frescoes recovered from the site. 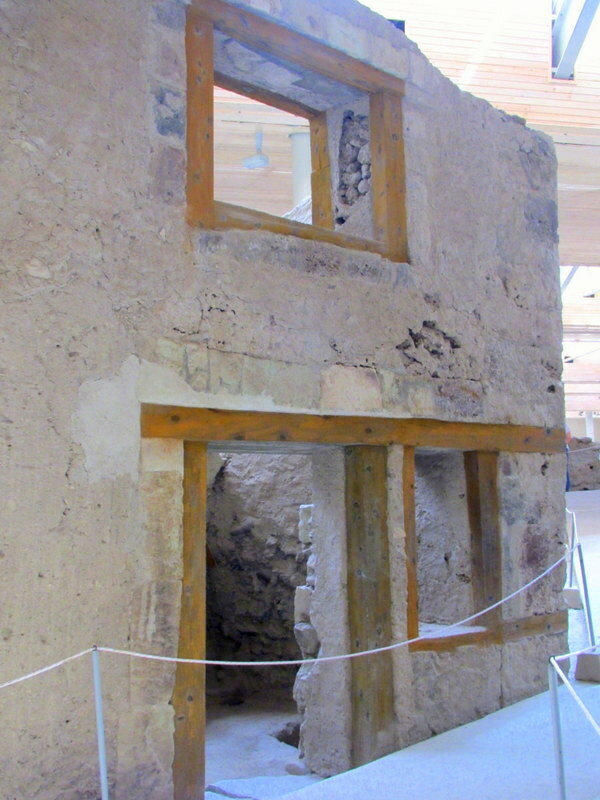 The door- and window-surrounds were made of wood because the inhabitants has discovered that wood timbers provided better earthquake resistance than stone. Here, concrete has been cast to replace the lost wood, but painted to resemble it. The window to the right of the door is thought to have been a shop window. The large size of the window on the upper floor is another indication of the freedom from fear of invasion enjoyed by the residents. 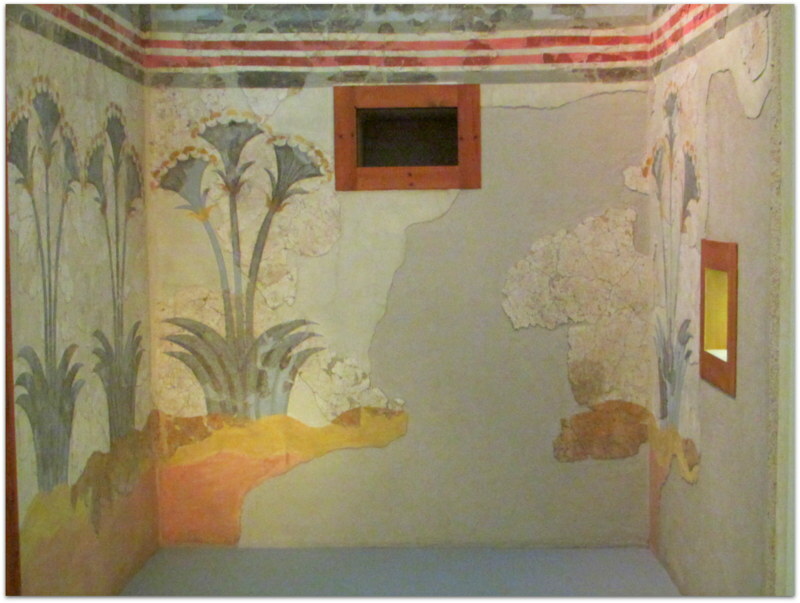 A set of the wall frescoes recovered from the West House and now preserved in the museum in Fira. 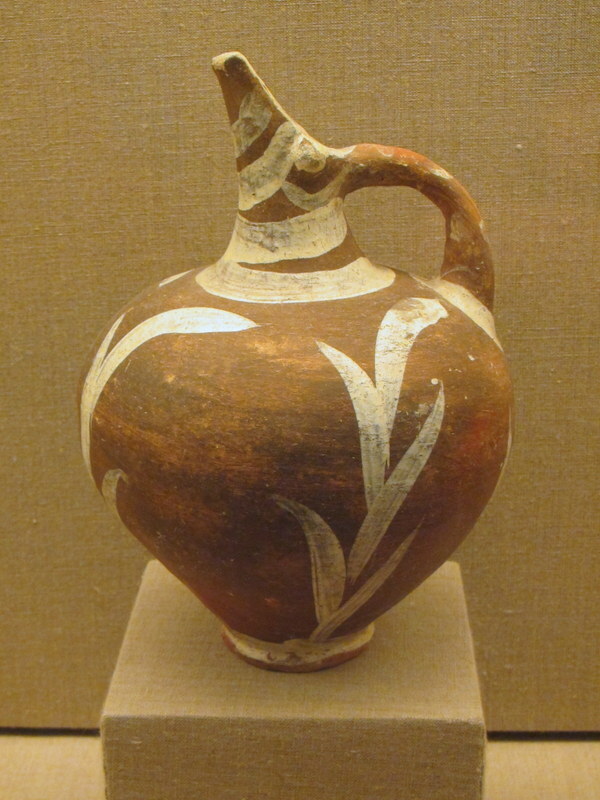 They represent a notable development over the Egyptian genre from which they derived in the amount of “white space” they employ, and in their purely decorative function. A couple of the beautifully decorated household items recovered from the site. 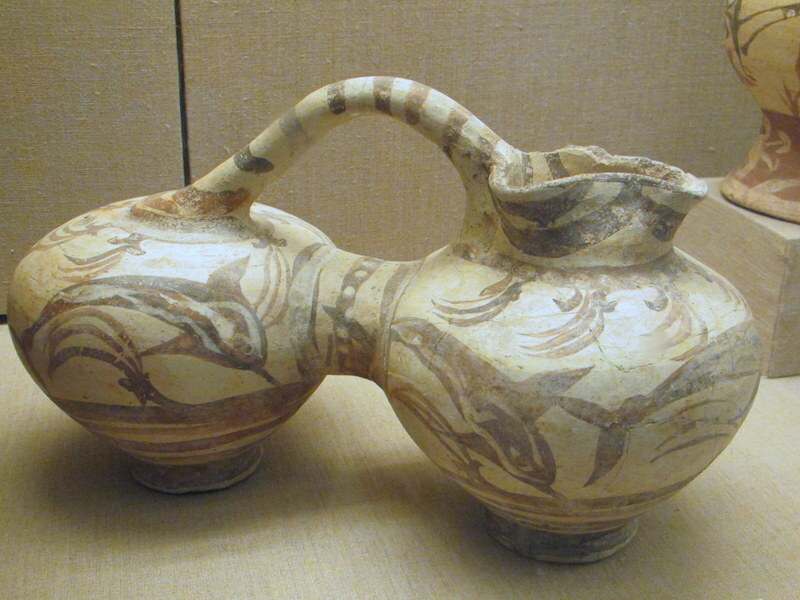 Interestingly, both the turned-up spout of the one and double bowls of the other may have served the same function — helping to separate and settle-out the sediment in the wine or other liquid served from these pitchers. This area is called Triangle Square, and it is here that West House is sited. 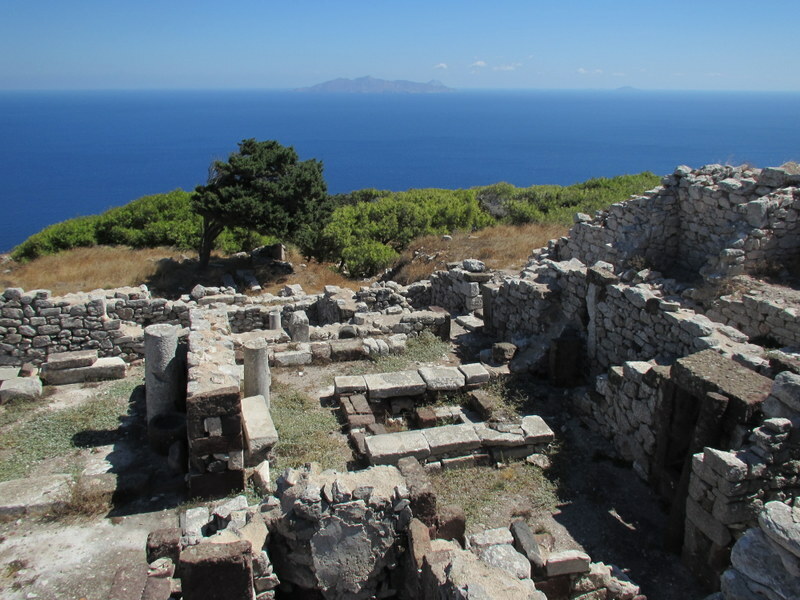 The experience of walking the streets of a 3700-year-old town is hair-raising. 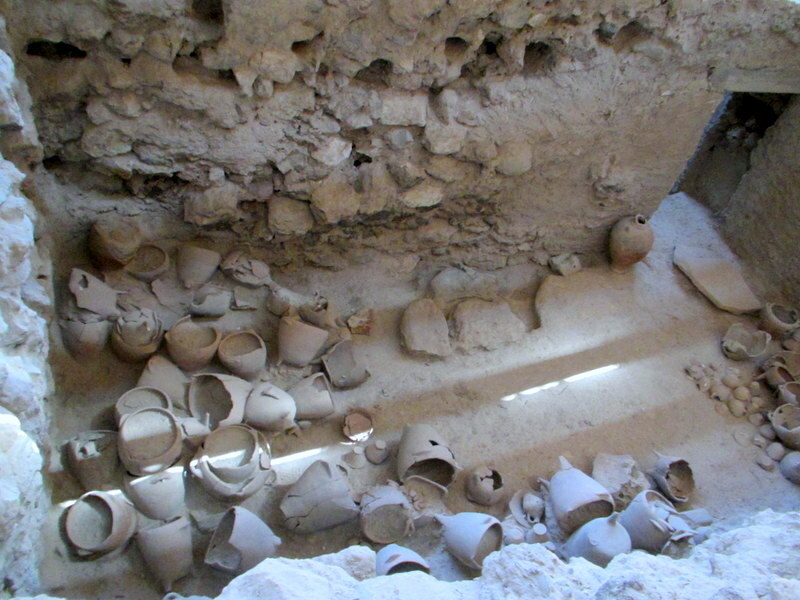 Apparently not everything could be taken, and there are many pots and amphorae to be seen as well as remains of some wood tables and bedsteads. 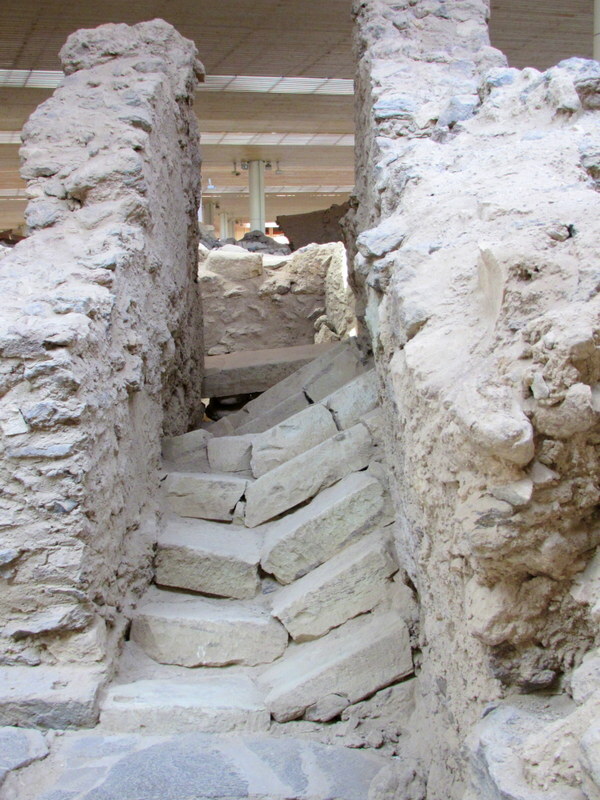 A reminder of the power of the earthquakes that accompanied the eruption, this entire set of stone steps broken in two. After the eruption, the bleak, lifeless shell of Santorini went uninhabited, except for fishermen and sailors camping, for almost 900 years. 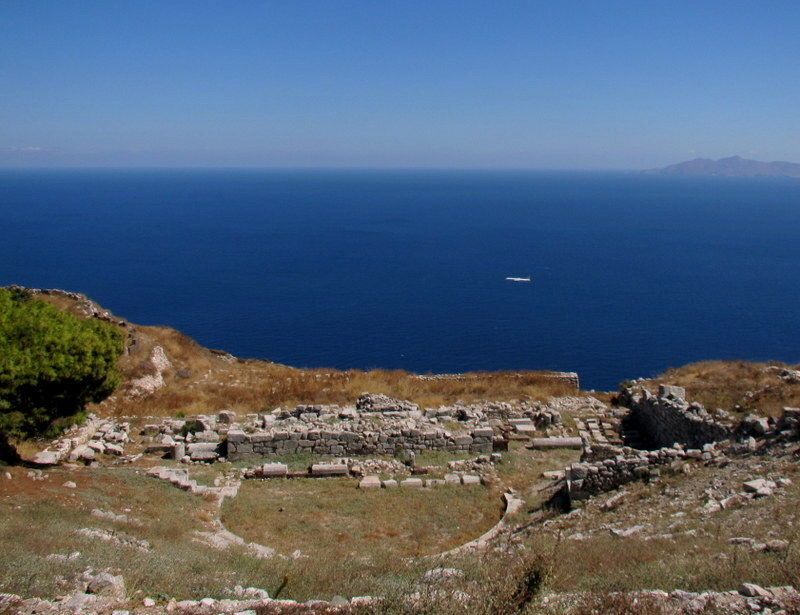 Then, in the 8th century BC, colonists from Sparta established a new city in a very different location. Atop a virtually impregnable cliff with shear 400 ft drops, a classic Greek city was laid out along the ridge top on the eastern side of the island, just a few miles north of Akrotiri. 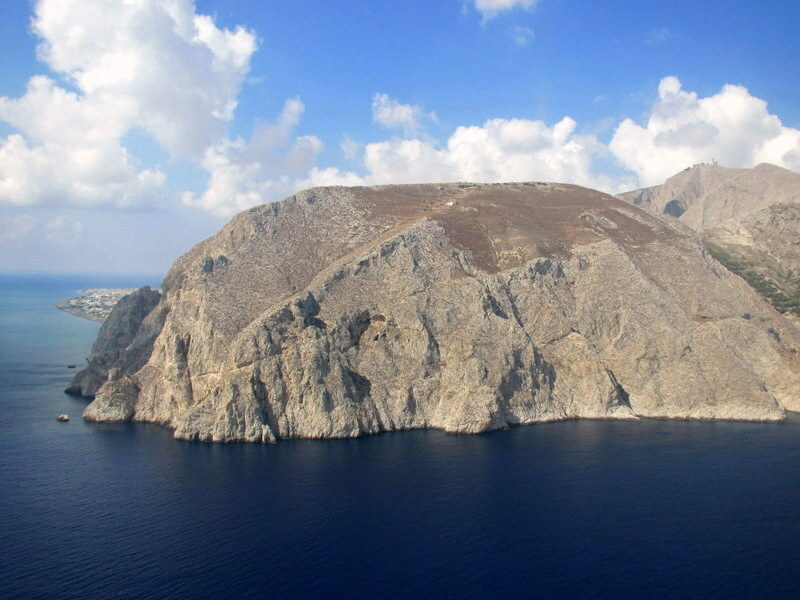 From the plane, the site of Ancient Thera on the top of this enormous rock. And, from Ancient Thera, a plane coming in to land at Santorini. The ruins of the theatre stretches down the hillside, maintaining the pattern of consistently beautiful backdrops I’ve seen in theatres across the county. 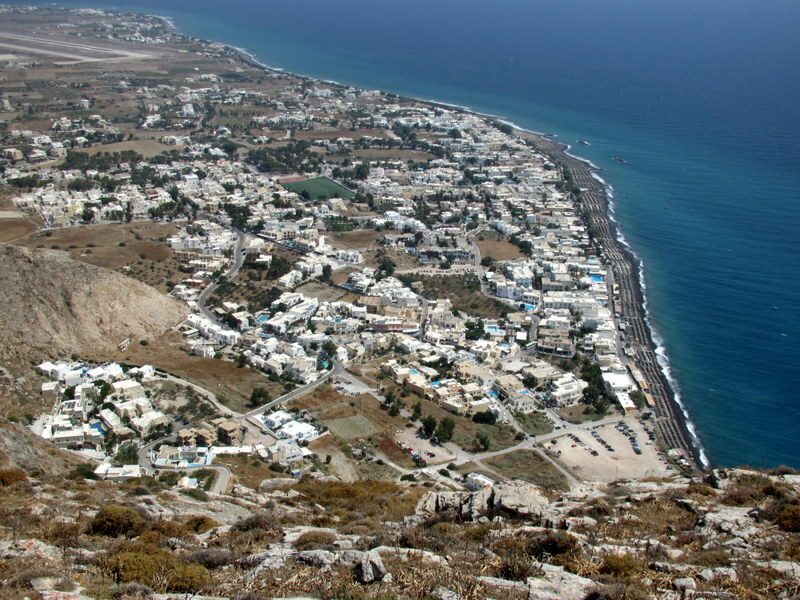 Anafi island is visible in the distance. 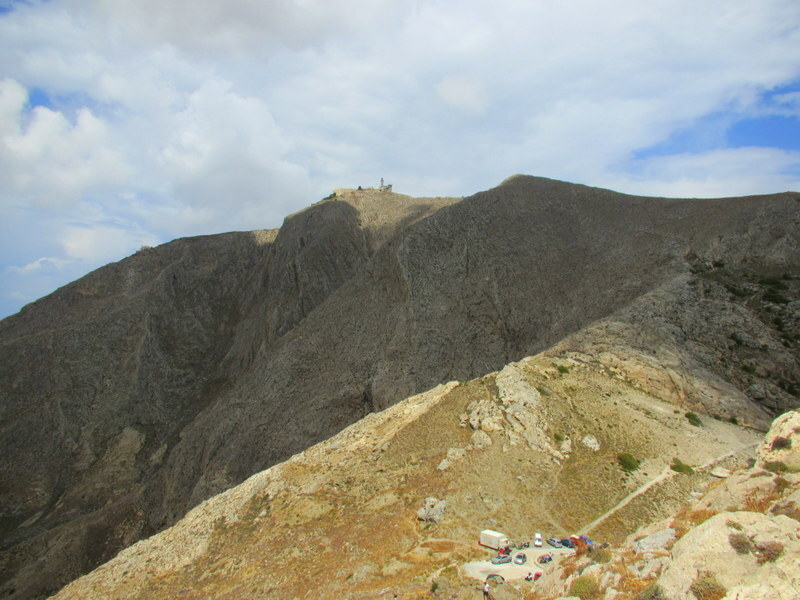 The ancient cemeteries were located on either side of the parking circle, on a saddle between the peak of Ancient Thera and the peak of Agios Georgios, just to the west. The view down to Kamari, the famous black sand beach. That’s the airport at the top left. 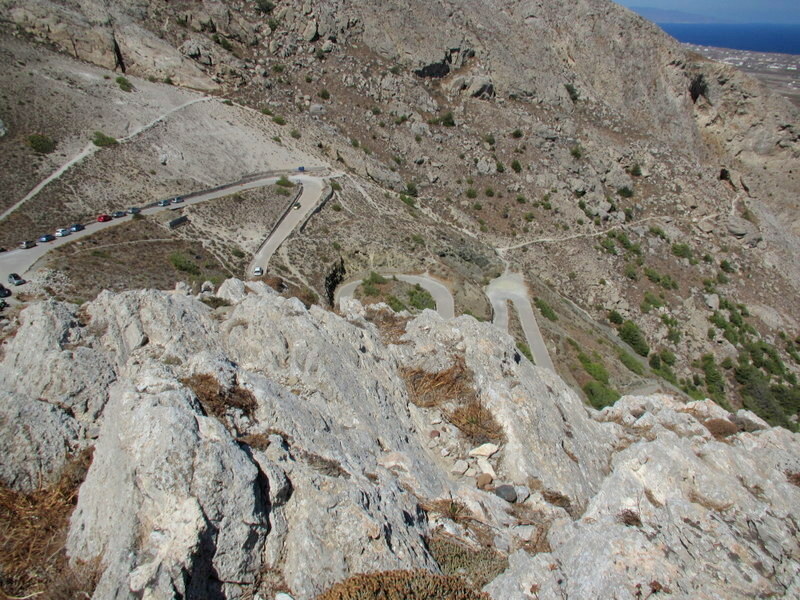 The road up to Ancient Thera. Twenty switchbacks — this photo doesn’t do it justice. BTW, Audrey had her baby last night….a little boy (Nicholas Mark). He was theoretically almost a month early, but he weighed in at 5#11oz. and he is doing everything a newborn should be doing. My guess is that they miscalculated the due date. Anyway, everyone is doing fine, so we are happy. We are looking forward to seeing you guys when you return. Should be soon, right? Glad you liked it, Jack, and congratulations on doubling down on grandparenthood. Sophia and Nicholas — two very Greek names that will make it extra easy for them to travel in Greece. Now we’ll just have to start calling you Ianni.